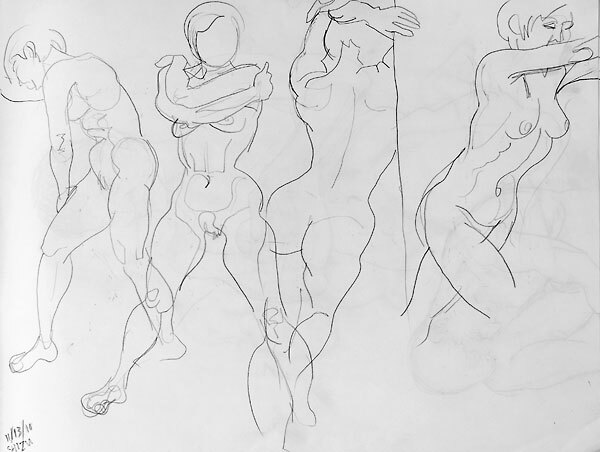 I fill up a sketchbook every couple of months with the quick (one minute to five minute) poses from the life drawing sessions I attend regularly. I almost never exhibit or sell these pieces. The sketchbook is a practice space. I try different media, experiment with things like varying the scale or drawing shadows as contours, and I really don’t worry that some of the drawings fall flat or even crash and burn. Sometimes I use a big sketchbook and sometimes a smaller one. In the fall of 2010, I filled up two 18″ x 24″ (45.7 x 61 cm) spiral-bound sketch pads. 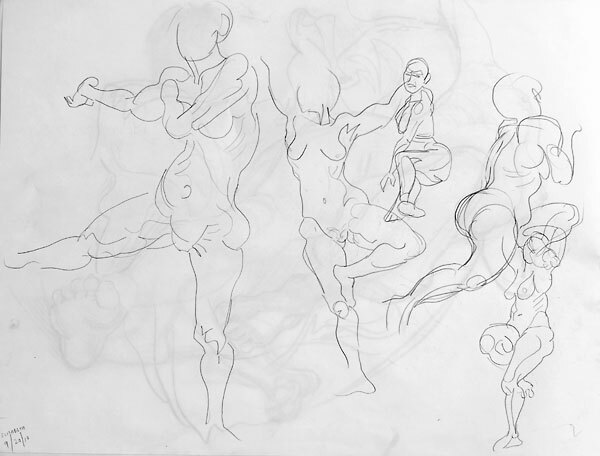 More recently, I’ve been using a smaller sketchbook, but when I looked back at the bigger ones I felt the fact that I could get multiple figures on a single page conveyed a sense of movement, of one pose flowing into the next, much more effectively than the smaller sketchbooks, where most of the poses are isolated one to a page. In this post I’ll share some of those fall 2010 sketchbook pages. Rather than discussing them individually, I’ll give the images in random order, with my thoughts interspersed. Most of the words relate to the whole set of sketches, not just those directly above or below. For me, a drawing can reproduce the form and structure of the body, the light and shadow, space and weight, with precision, and that can be beautiful. 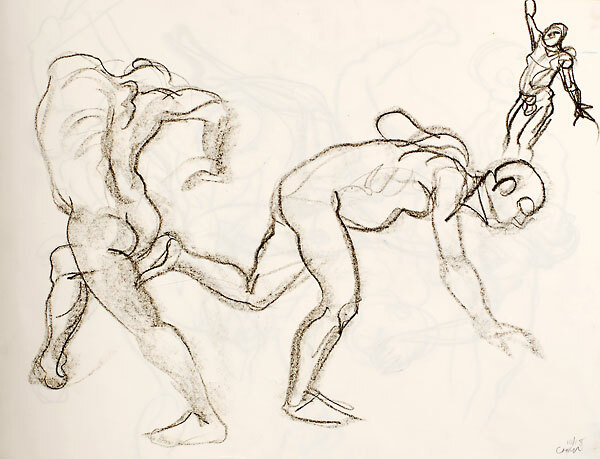 But if a drawing captures the feeling of living energy or movement, now that’s exciting. So I like to view a series of quick poses as a kind of dance performance. 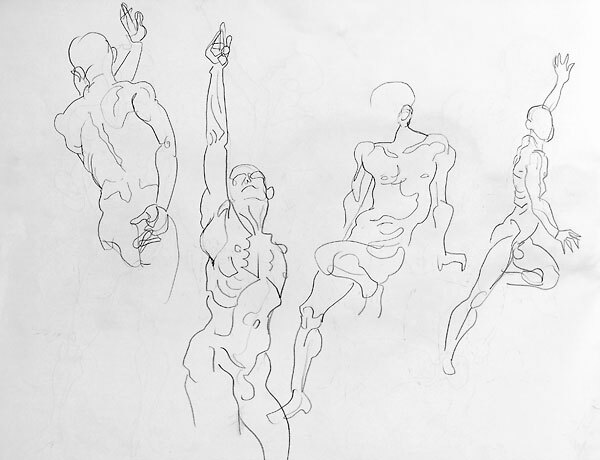 Most, maybe all, of the sketches in this post are from two-minute poses. 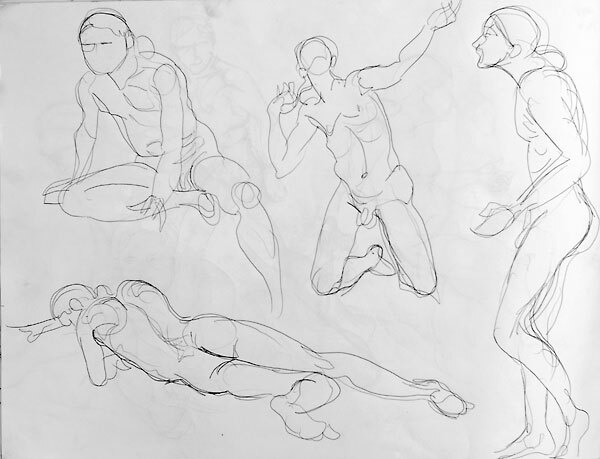 In a typical quick pose set, a model will perform ten two-minute poses of their own choosing. Usually the monitor or supervisor of the session will call “Change,” at two minute intervals. It’s like a dance, but instead of being performed in flowing movement, it’s composed of a series of held positions. Many of the models are dancers or actors. Others are visual artists themselves, or writers, musicians, athletes, bodyworkers, yogis. 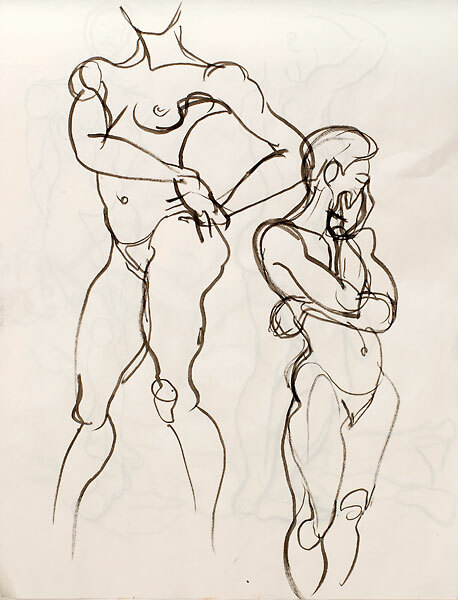 Some of them have a deeper working knowledge of anatomy than do most of the figurative artists drawing them. Some models want to express emotion, others want to show energy, to reveal structure, or to explore grounding and focus. I don’t just look at the pose. I watch the transitions even more intently. 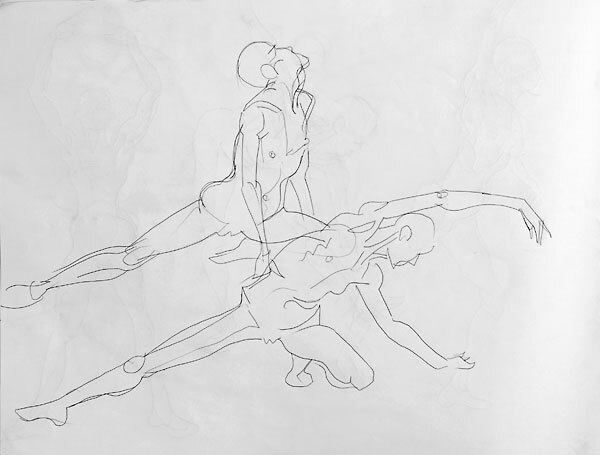 In the way the model moves from one pose to the next you can see where in the body the energy is concentrated, where there is a push or a pull into the next pose. 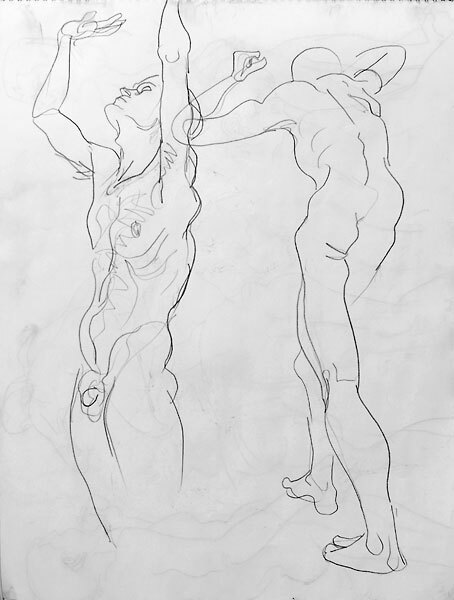 The contours that express that impulse or that tension are the lines that make the drawing dynamic. 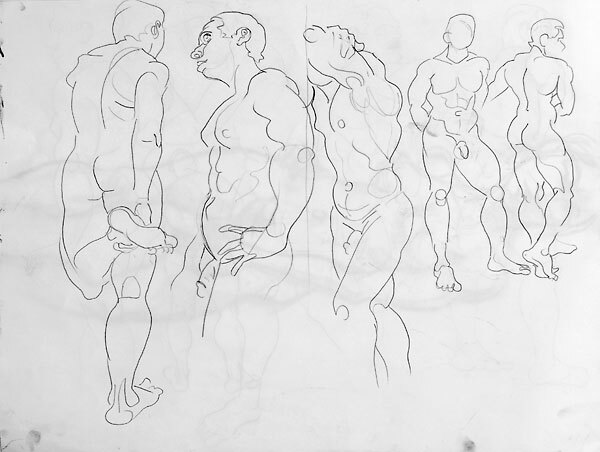 At the two drawing venues I attend regularly, Spring Studio and Figureworks Gallery, we’re fortunate to have a great variety of models, ranging in age from 18 to 90 or so, and in body type from emaciated to corpulent. Our models also vary greatly in their personality and their approach to the job of modeling. I look for the characteristics that make each model unique. This means focusing on specific curves and angles. 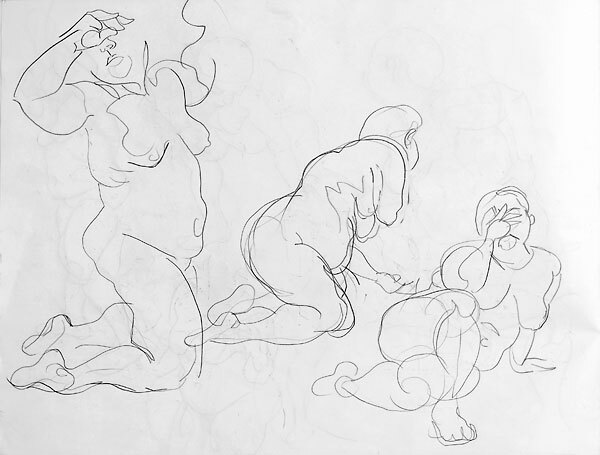 Some teachers of drawing urge an approach that simplifies and abstracts the body structures, but too much abstraction makes all the figures generic. It’s much more interesting to be as specific as possible. Each model has particular qualities. The model above has long, angular limbs and a face that reaches forward with intensity. The one below has an elegant torso that is all parabolic curves, with a beautiful bowlike collarbone. 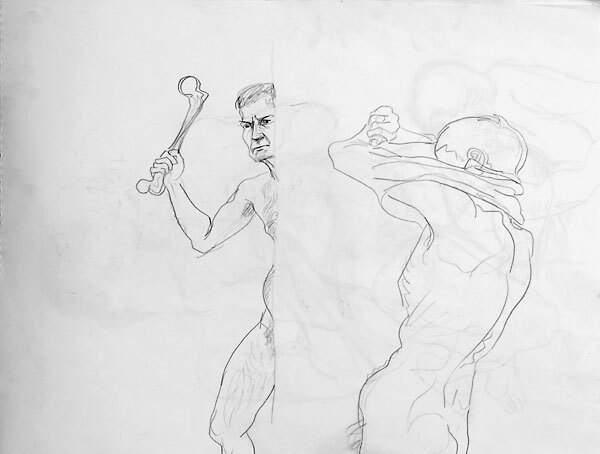 In The Natural Way to Draw, Kimon Nicolaides teaches a method of learning figure drawing that starts from two seemingly opposite exercises – scribbly, spontaneous “gesture” drawing, and slow, painstaking “contour” drawing. When you get more practiced, you begin to understand that every contour has a gestural expressive aspect, and every gestural marking has its own contour, so these extremes meet and merge. I often let the figures spill off the edges of the page. 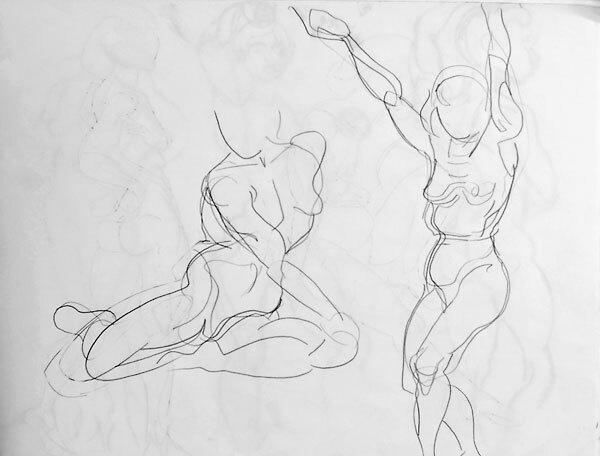 The sketches can look more dynamic that way, and it is often more interesting to capture more detail in the most dynamic part of the pose than to spend that time dotting the i’s and crossing the t’s, so to speak. 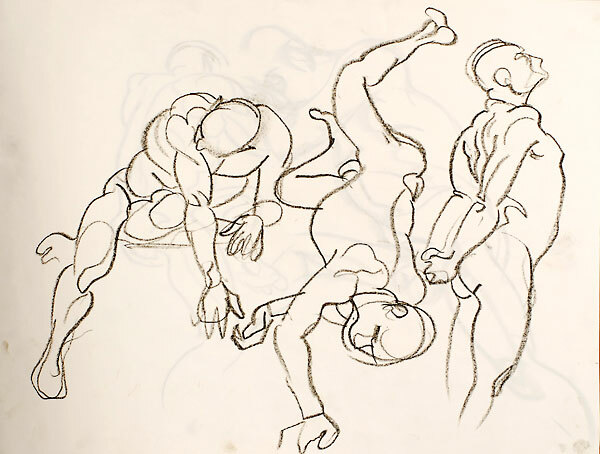 But the direction of the head, and of the hands and feet, can be an important part of what makes the pose expressive. Some models like to act out scenes or perform actions, either everyday ones or dramatic ones. 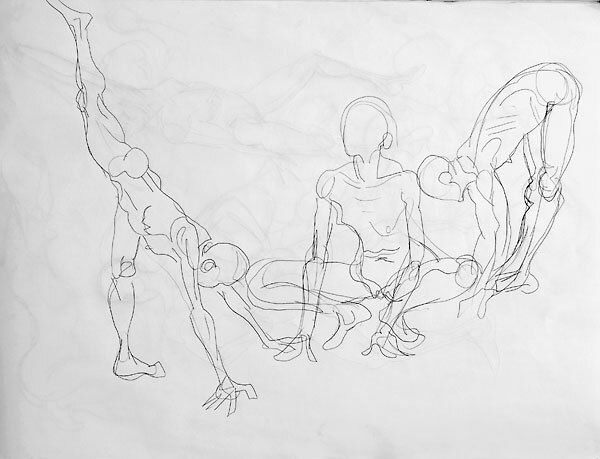 Some models come out of one pose completely and then go into a completely different next pose, while others treat the transition from one pose to the next as a flow, perhaps keeping part of the body anchored while another part changes direction. Some models are students of the history of figurative art, and derive their poses from what they’ve seen in the work of Caravaggio, Rubens, or Rodin. Some models take casual poses, varying attitudes or presentations of the balanced body. Other models like to use quick poses to explore their limits of stretching or balancing, taking poses that are highly challenging to hold even for one or two minutes. Poses that twist or reach into open space tend to untwist or droop a bit, even in just a minute or two. Many of the classic poses involve bracing one part of the body against another or against a wall or support, to ensure stability. Most models have a repertory of poses that they use frequently. Most have a consistent style or feeling that is maintained through a whole set of long poses. When the feeling or type of pose changes radically from one to the next, a multi-pose page looks less like a record of the flow of movement, and more like a scene with more than one character. A set of quick poses usually reveals more of the particular character of a model than a long pose does. It’s not possible for a model to really push limits or put intense energy into a long pose. 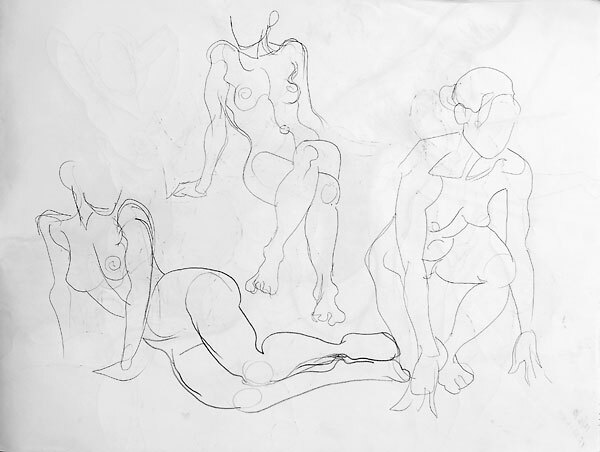 Quick poses are a performance, a gift of energy to the artist. I always feel that I must give total focus and intensity to this exercise. Like most of the good things in life, a quick pose must be savored in the moment, because it can’t last long! All of these sketchbook pages are 18″ x 24″, and all were made between September and December of 2010. All are done in pencil unless otherwise noted.